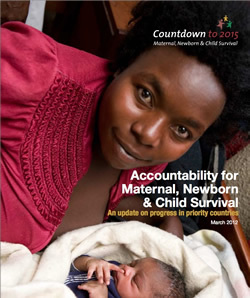 As follow-up to the Global Strategy for Women’s and Children’s Health, Countdown to 2015 released Accountability for Maternal, Newborn & Child Survival: An update on progress in priority countries, with updated profiles on high-burden priority countries that account for over 95% of maternal and child deaths. The report was launched at the 126th Assembly of the Inter-Parliamentary Union, which took place in Kampala, Uganda from 31 March through 5 April 2012. The profiles in this publication highlight how well each country is doing in increasing coverage of high-impact interventions that can save the lives of millions of women and children. The core indicators included in these updated profiles, selected in 2011 by the Commission on Information and Accountability for Women’s and Children’s Health, encompass key elements of the reproductive, maternal, newborn, and child health (RMNCH) continuum of care. The report also includes a brief report providing a snapshot of progress on these core indicators across the priority countries, revealing promising news as well as challenges that still remain to be addressed. The country profiles in this publication, customized to showcase the Commission indicators, are adapted from the full, two-page Countdown country profile, which Countdown produces on a roughly two-year cycle. Full country profiles will be included in Countdown’s 2012 Report, which will be published in June 2012.